Did someone say healthy smores? 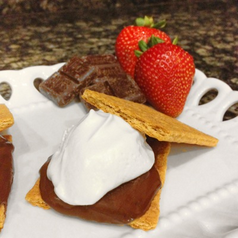 "Let's be honest, summertime reminds most of us of s'mores. The roasted marshmallows and melted chocolate are reason enough to hunt for twigs in the first place. But if you're like us, you're looking for s'more ways (sorry, we had to) to make this summertime treat a little less guilty. Lo and behold – here are five healthier, more natural alternatives to the ooey gooey classic."